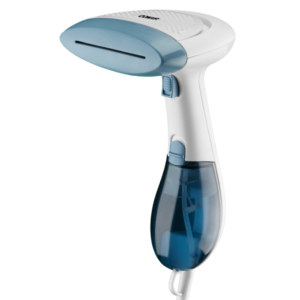 Our 1110 watt handheld fabric steamer uses dual heat technology to give you fast, hot steam for great results. With two heat settings, it can handle most fabrics, from heavy cotton and wool to delicate satin and silk. The steam trigger provides constant steam as well as an energy-saving steam pause feature. It’s lightweight and easy to use, with a nine-foot power cord for maneuverability. This professional hand-held garment steamer includes three removable attachments: fabric brush, creaser, and soft cushion brush to help bring your garments to life.